This new Facebook function will make your business page pop! 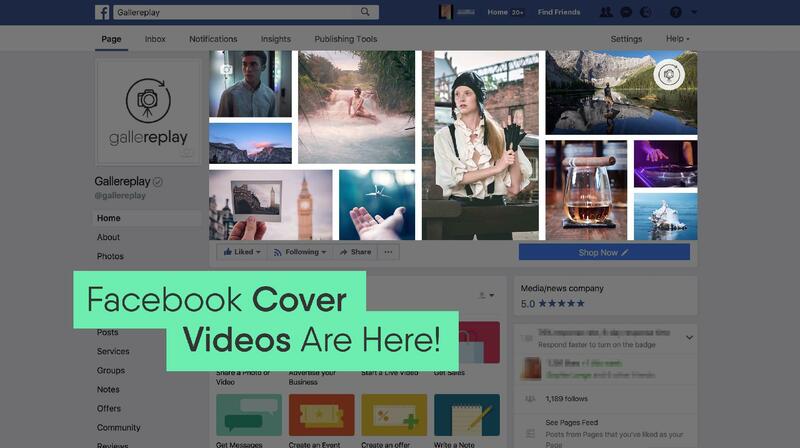 Facebook is rolling out cover videos. Find out how to switch from photo to video and which type of content is most likely to engage your followers and potential customers. Exciting news for social media marketers and entrepreneurs: business page owners can now replace their Facebook cover image with a video. Facebook cover videos play back automatically and in a loop. The function has already been enabled on many of the 65 million Facebook business pages. This brings a much-needed make-over to Facebook’s business pages and is part of the social network’s plan to create a “richer experience” there. And it’s about time. Think about all the business pages you’ve visited over the years – how many cover photos do you recall? Not many, you say? I don’t either. Thanks to the introduction of moving images, Facebook covers are about to get a whole lot more memorable. In this blogpost I’ve gathered everything you need to know in order to bring your business page cover to life. Let’s get started! Let’s begin with the basics. First and foremost you should check whether cover videos have been enabled on your Facebook business page. If the function is available to you, you should see a video camera flashing at the top left corner of your Facebook cover image. Next, here’s an overview of the technical specifications required, in order for your file to work as a Facebook cover video. Facebook asks for a minimum resolution of 820×312 pixels, but recommends 820×462. We here at gallereplay recommend a resolution of 1280×720. When uploading a video in 820×462 from a desktop computer and positioning it to your liking, it will look equally good on mobile. In desktop mode the view is a little more “landscape” and takes on an aspect ratio of approximately 16:6 (for instance 820x312px); on mobile the entirety of the image is displayed. By comparison: if you upload a video in 820x312px via desktop, it will be displayed letter boxed (i.e. with black bars on the top and bottom) or it will be cut off on the left or right side, since Facebook will automatically adopt a 16:9 aspect ratio. So now we know why 820x462px is better. But modern retina screens require twice the number of pixels, in order to display a 100% sharp image. This is because their pixels are half the size of conventional displays. According to this logic, the videos should therefore be 1640x924px. Uploading videos in this size is possible, Facebook will however automatically compress the files down to 1280x720px to save space. Our tests confirmed that both the height and the width of videos were capped at 1280px. For this reason we recommend 1280x720px, since this resolution will provide a sharper image on a retina display than the same file in 820x462px. Further tests by gallereplay revealed that it is possible to upload videos in other aspect ratios. However, uploading a video in an aspect ratio other than 16:9 – for instance a square format – would mean that parts of the image would lie outside visible areas on both desktop and mobile. Now that you have an overview of the technical requirements, here are step-by-step instructions on how to bring video to your Facebook business page. Check whether the cover video function is already available on your Facebook business page (as described above). Find a video, video loop or cinemagraph, that can be used as Facebook video cover images (browse our collection for inspiration). Double-check that your video file corresponds to the technical requirements outlined in the previous section (alternatively you can have us optimize it for you – see our special offer in the next section). Click the “Add a Cover” button. From the dropdown menu select “Upload photo/video”. Once your video has loaded, click and drag it to adjust its positioning. Then click “Next” at the bottom right of the screen. Make sure the switch marked “Automatically replay video in a loop” is enabled to keep your content playing repeatedly. Press “Publish” to make your Facebook Cover Video public! With this function now at your disposal, you have the opportunity to stand out from the crowd and “wow” your page visitors. But which type of video content should you choose for your cover? First of all, videos with jerky movements and fast edits should be avoided as they can irritate and distract visitors from the other content around them. Less is more: a serene scene with gentle movements can be just as engaging, without antagonising the visitor. Secondly, why not take advantage of the fact that cover videos loop automatically? That’s right: video files published as cover videos will automatically begin playing again from the top. By using clever content like seamless video loops and cinemagraphs, you can elegantly create the illusion of a never-ending cover video. For this reason, cinemagraphs work particular well as cover videos. They are essentially living photographs: still images in which a minor and repeated movement occurs. Thanks to their combination of still and motion elements, they are eye-catchers that have been proven to increase dwell times and click through rates. Cinemagraphs are versatile and can be applied to Facebook cover videos in a number of ways. You could use a single cinemagraph that loops infinitely. You could use a sequence of cinemagraphs, that change intermittently. You could even use a collage of different cinemagraphs like the one we use on our own gallereplay Facebook page (below). All in all, Facebook cover videos represent an opportunity to make more out of your Facebook business page and stand out from your competition. In my eyes, cinemagraphs are the ultimate medium for this new function, due to their elegance, ability to catch the eye, and the fact that they loop seamlessly. So seize the moment and engage your visitors by bringing your cover photo to life! Looking for tips on how to publish cinemagraphs across your social media channels? Take a look at our in-depth guide, detailing how to post cinemagraphs on Facebook, Instagram and Twitter.